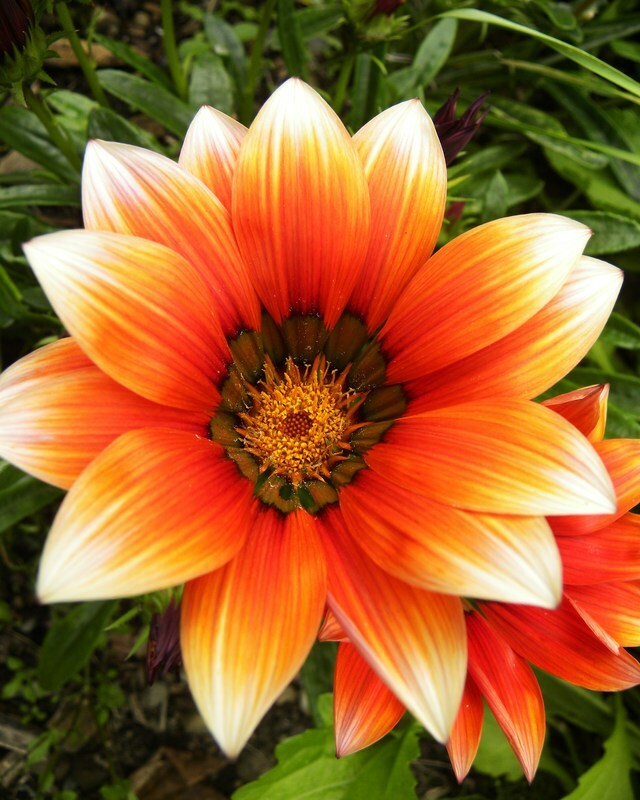 Join us on midsummer's evening for a wonderful concert of well know music, including Bach's Air on the G String and the Allegretto from Beethoven's Symphony no 7, (most well known from the film The King's Speech). We will be joined on the evening by special guests, The Musical Suspects. Concert will last approximately 1 hour. 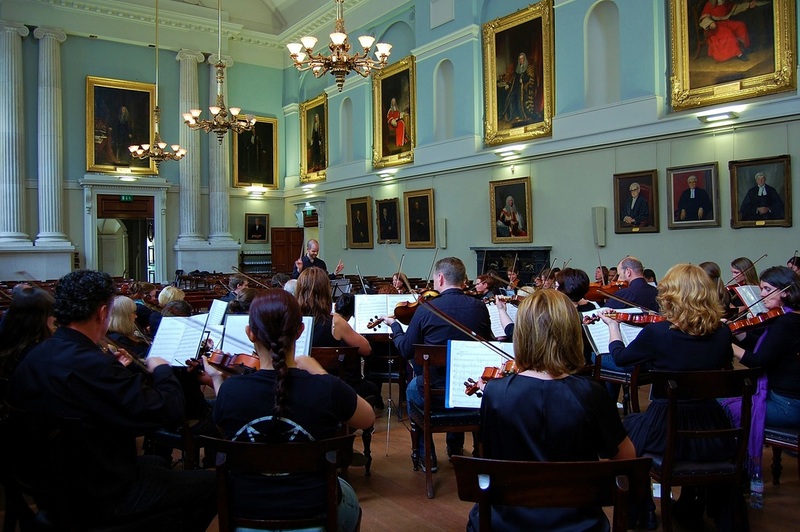 The Offbeat Ensemble are delighted to announce that they will be performing a family concert in aid of the St. Peter's Violin Project, Phibsboro, Dublin 7 on 28th February, with special guests, the St. Peter's National School Orchestra. This inspirational and very successful violin project gives lessons to almost 500 children weekly, free of charge. The orchestra promises an afternoon of fun music, featuring pieces such as Looney Tunes, Themes from Harry Potter, Themes from Pirates of the Caribbean, Let it Go from Frozen, Jurassic Park, Game of Thrones, Somewhere Over the Rainbow and much more. We are delighted that the wonderful St. Peter's National School Orchestra will be joining us on the day to perform a number of pieces. 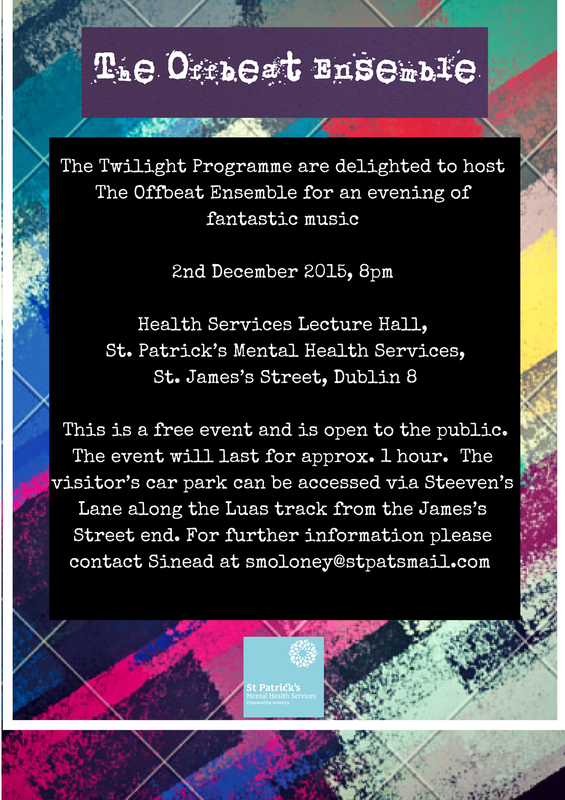 The Offbeat Ensemble are delighted to announce that they will be performing a family concert in aid of the Music Makes Magic Violin Project, with special guests, the Howth N.S. Orchestra. The orchestra promises an afternoon of fun music, featuring pieces such as Looney Tunes, Themes from Harry Potter, Themes from Pirates of the Caribbean, Let it Go from Frozen, Jurassic Park, Game of Thrones, Somewhere Over the Rainbow and much more. Children are welcome to come dressed as their favourite character! This is a free event and is open to the public. The event will last for approx. 1 hour. The visitor’s car park can be accessed via Steeven’s Lane along the Luas track from the James’s Street end. Join The Offbeat Ensemble on the 16th December at All Hallows College for our annual Christmas concert. This year we are joined by special guests, the Ceiliuradh Choir. Pieces on the evening will include Sleigh Ride, Trepak, Gloria by Vivaldi, Santa Claus is Coming to Town, and lots more festive favourites to get you in a great mood for Christmas! Tickets: 5 euros (and 2 euros for children under 12) available at the door. 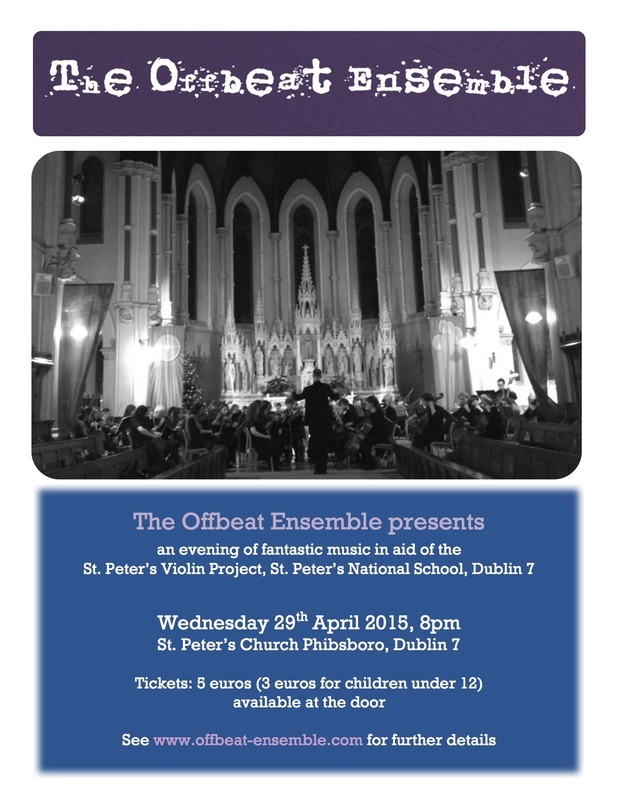 The Offbeat Ensemble are delighted to announce that they will be performing a concert in aid of the St. Peter's Violin Project, Phibsboro, Dublin 7 on 29th April 2015. The very successful project gives lessons to almost 600 children weekly, free of charge. The proceeds of this benefit concert will be used to purchase good quality instruments for 6th class pupils who will moving onto secondary school at the end of this year. It is hoped that the gift of a string instrument will incentivise pupils to continue with and engage in further music studies beyond their outstanding musical grounding in St. Peter’s. Please click on the document below to read more about the St. Peter's Violin Project. The Offbeat Ensemble performed a fantastic evening of music to a packed house in All Hallows, just before Christmas. Pieces on the evening included Sleigh Ride, Crocodile Rock, Handel's Hallelujah Chorus, Trepak, The Emperor Waltz, Santa Claus is Coming to Town and lots more festive favourites. The Offbeat Ensemble presented their Summer Concert on June 19th. The newly formed KBC Choir joined us as our special guests for the evening. The programme included music by Tchaikovsky, Beethoven, Dvorak and Rimsky-Korsakov, as well as favorites such as Leonard Cohen's Hallelujah. The Offbeat Ensemble were honoured and very excited to play to an extremely appreciative audience at the launch of the fantastic Phizzfest ; Phibsboro's community arts festival. The event also featured readings by the award-winning poet Paula Meehan. The Offbeat Ensemble were delighted to be asked to take part in a concert as part of Temple Bar Tradfest 2014. The event, which commemorated the Battle of Clontarf, took place in the stunning surroundings of St. Michan's Church, and featured music commissioned by Deep End of the Ford. The Offbeat Ensemble played in the finale of the event - the world premiere of a beautiful song called "The Walls of Dublin". 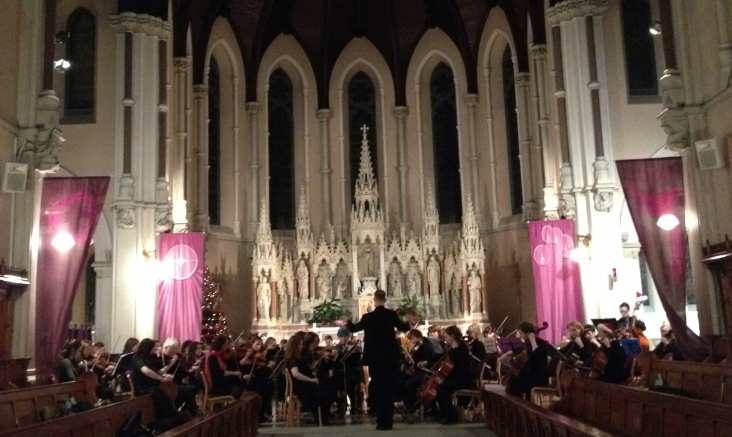 The Offbeat Ensemble performed a fantastic evening of music in the beautiful venue of All Hallows College, Drumcondra. The orchestra got the audience in a great mood for Christmas. Pieces included Beethoven Finale, Trepak, Wipe Out, Handel's Water Music, Largo from Dvorak's New World Symphony, and of course, some Christmas Carols. The Offbeat Ensemble presented their debut concert - the first time most of the orchestra had ever played a concert. It was an amazing success and everyone loved playing in such a beautiful venue.